The Sonoran Sun is one of the most luxurious resorts on Sandy Beach. The resort has a very grand tiled corridor where you will find the on-site convenience store and check in lobby. The resort has many five star amenities like a state of the art fitness center, Emiliano's Restaurant and bar, beachfront swimming pools, Jacuzzi, BBQ's, palapa's, and a full service spa. You will be in for a real lap of luxury when you stay at the Sonoran Sun. This is truly paradise! This 2 bedroom and 2 bathroom condo is located on the 4th floor of the West Tower. This condo can sleep 6 people; 2 in each bedroom and 2 on the queen size sleeper sofa in the living room. The living room of this condo has bright yellow Venetian plastered walls with a tan leather and wood sofa and two complimenting arm chairs. The room has a wall hung metal framed mirror, coffee table, silk plants and a media cabinet. The media cabinet includes a TV, DVD, VCR and CD player. The condo comes equipped with high speed wireless internet and cable television. You can access the terrace through the sliding glass doors off the living room. The dining area has a round light wood table with seating for four people. The kitchen has dark maple wood cabinets with granite counter tops and white on white appliances. The kitchen also has a built-in bar with bar stools. 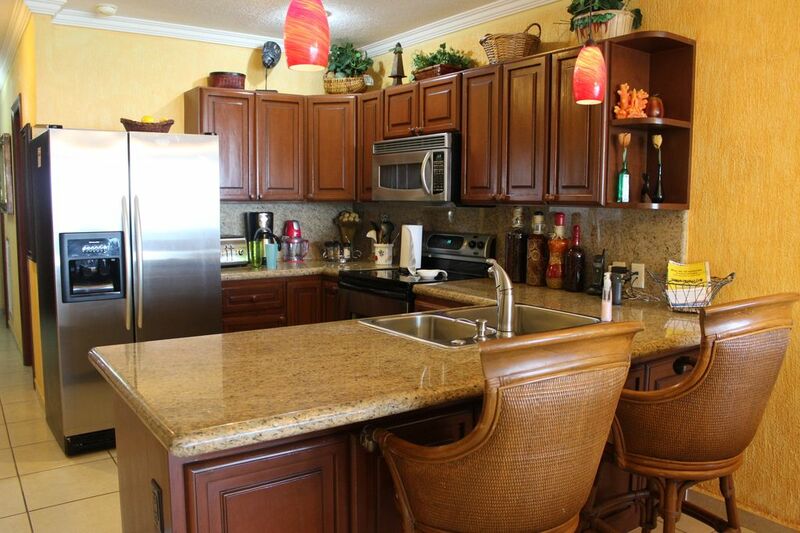 This kitchen has everything a five star chef would need to prepare a delicious gourmet meal. The only things you will need to provide are the food and beverages. The master bedroom has a large king size four poster bed with a brown and cream colored floral bedding set. The room includes two lighted bed side tables and a dresser with a TV. You can access the terrace through the sliding glass doors off the master bedroom. The master bedroom also has a large double door closet with full length mirrors. The master bathroom has a double sink vanity with a walk in shower and commode. The 2nd bedroom has yellow and brown painted walls with a queen size bed that has a faux hibiscus flower head board and red patterned bedding. The room has two lighted bed side tables and a dresser. The room also has a large double door closet where you can hang your clothing. The 2nd bathroom can be accessed through the 2nd bedroom or the hallway. The 2nd bathroom has a single sink vanity with a walk in shower and commode. The terrace is furnished with a round glass top table and four chairs. The terrace is the best place to enjoy dinner while you watch the sunset over the Sea of Cortez. You could also kick back and relax with a cocktail and watch the tide roll in and out. In the mornings enjoy your coffee on the terrace and wake up breathing in the salty ocean air. The condo comes with a washer, dryer and ceiling fans throughout. You will not be disappointed with the luxury and comfort in this condo. You should check now for rates and availability. Book your trip now! Paradise awaits you! The unit was sufficient but had some signs of wear. There was little maid service and we washed our own towels and asked for paper towels as there was none in the unit. It was a pretty cold week, and the big pool was being refurbished. We spent the week in the smaller pool and one hot tub that was warm enough to go in. Even though we have stayed here before, I think next time we come we will try another property. Unable to lock patio door. 2nd BR broken tiles and falling off wall and shower. Had to remove trash. Broken light bulbs in the BR. Somewhat challenged. Could tell that it was an older property. When we arrived we were short towels and face cloths. The views are amazing. The rooms were clean and comfortable. Spacious condo complemented with extravagant ocean view! Beautifully updated condo with large bedrooms and a master bedroom with en suite and direct patio access overlooking beach.